If you have read any of my previous blog entries, you have probably figured out that I love the dining at Walt Disney World. The food is part of the Walt Disney World experience in my opinion. 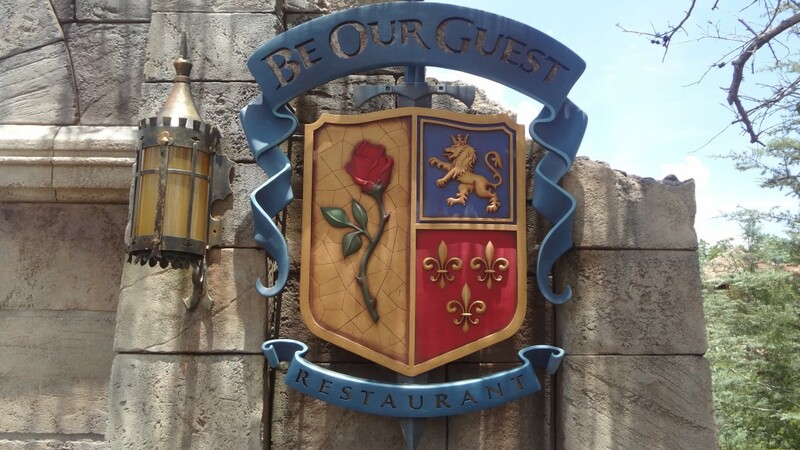 So today, I would like to share with you the dining experience for lunch at Be Our Guest which is located in the Magic Kingdom’s Fantasyland. 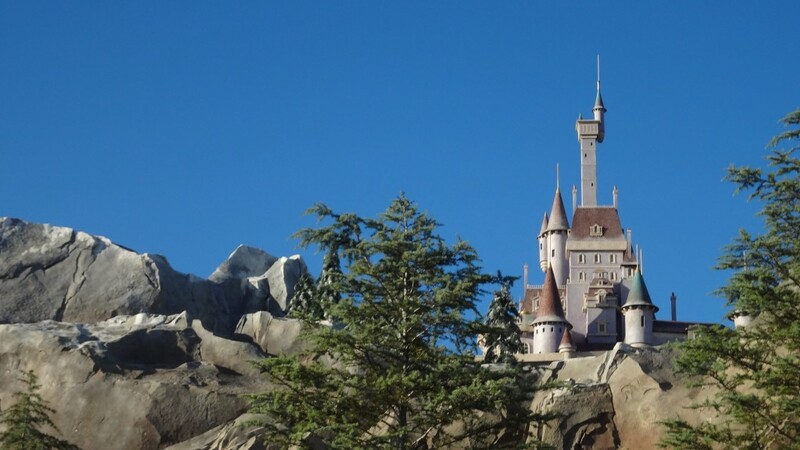 Let us jump onto our Magic Carpet, travel to France to visit Beast’s Castle. Be Our Guest serves lunch as a counter service from 11:00 until 2:30. After lunch hours are over, they transfer the restaurant into a table service beginning dinner at 4:00. Ever since Be Our Guest first opened in December 2012, it has been one of the most popular dining locations inside the Magic Kingdom. Lines begin forming outside the door before 10:30 even though it does not open until 11:00 for lunch. I must admit, I have waited in this line during two different occasions. 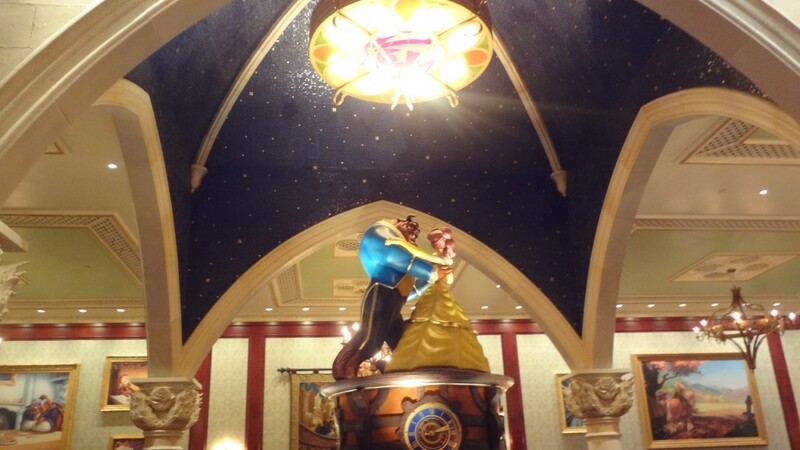 My very first time dining at Be Our Guest was July 2013. It was around 12:30 and the line was long and it was extremely hot outside! I was not looking forward to waiting in the heat. However, Disney definitely knows how to take excellent care of their guests! Cast members walked up and down the line, offering umbrella’s for guests waiting in the hot sun. 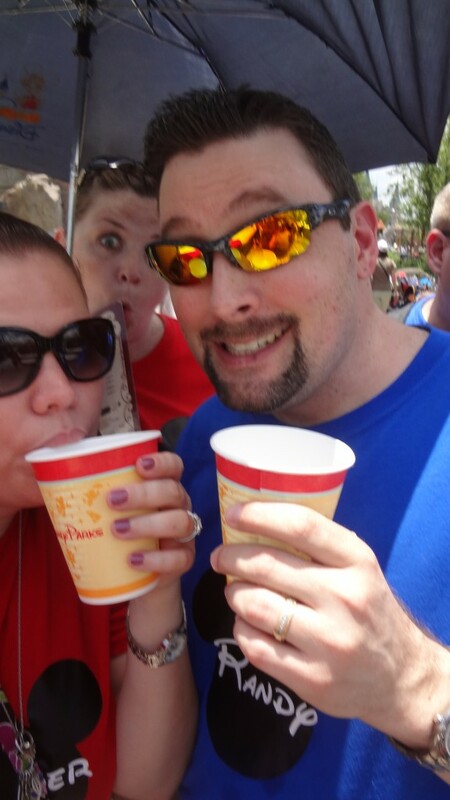 They also had a water station set up with cups and ice cold water so that guest could stay hydrated in the heat. It made waiting in line much better! Plus, an excellent photo op with friends!! Refreshing with some water while we wait. 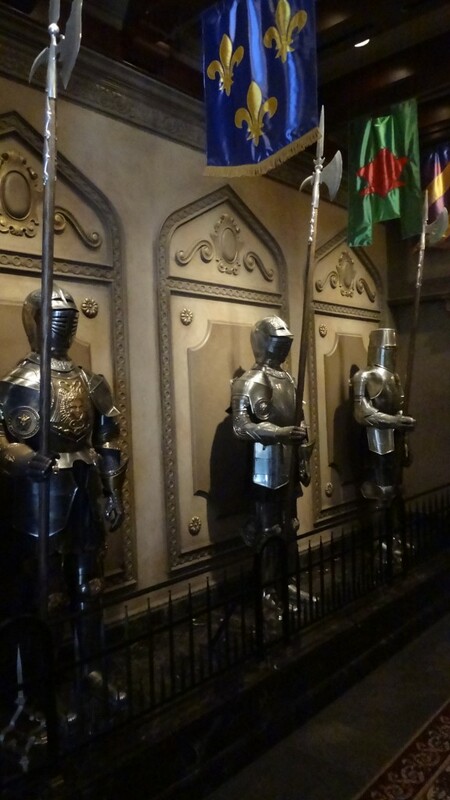 Once inside, you walk down the front hallway which is lined with amour soldiers, guarding the hallway on either side. Listening very carefully, you might just hear some of them talking or even snoring! 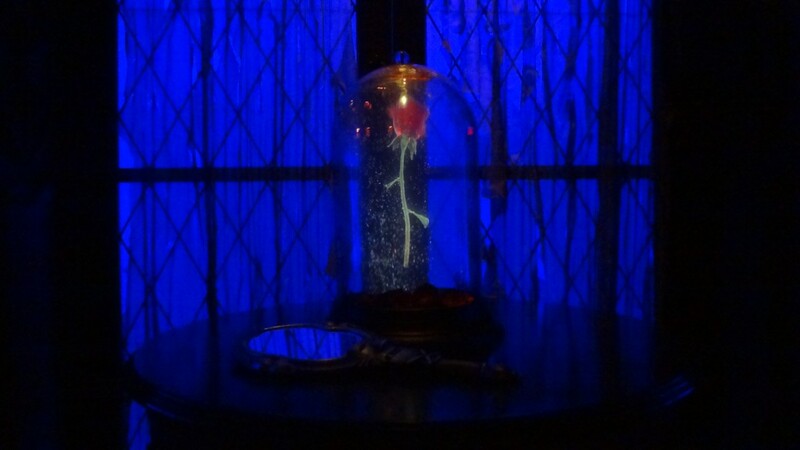 Right before you reach Beast’s library, you will be handed a red rose petal. This is no ordinary rose petal – it has very special powers. 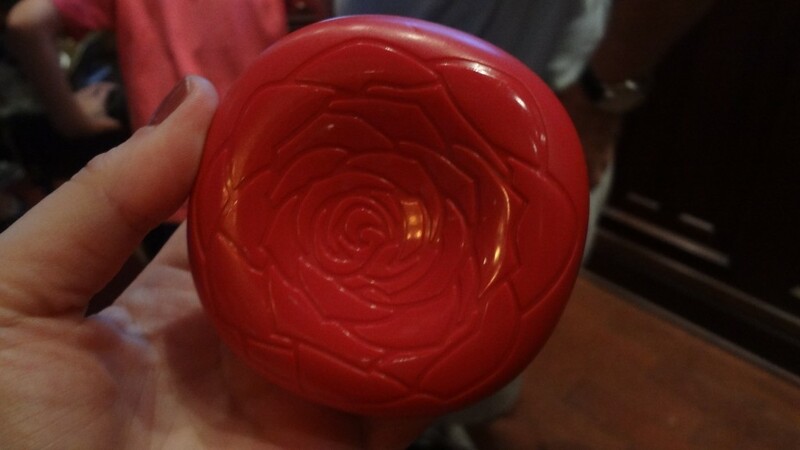 The rose petal will allow the cast members to find you to bring you your order. It is simply magical! It is now time to step into the Beast’s library to order your food. I love placing our order at Be Our Guest! You will either be guided to a cast member at a cash register or to a magical touch screen ordering station. I love using the touch screen. Using your MagicBand and/or rose petal, your order is connected to you. 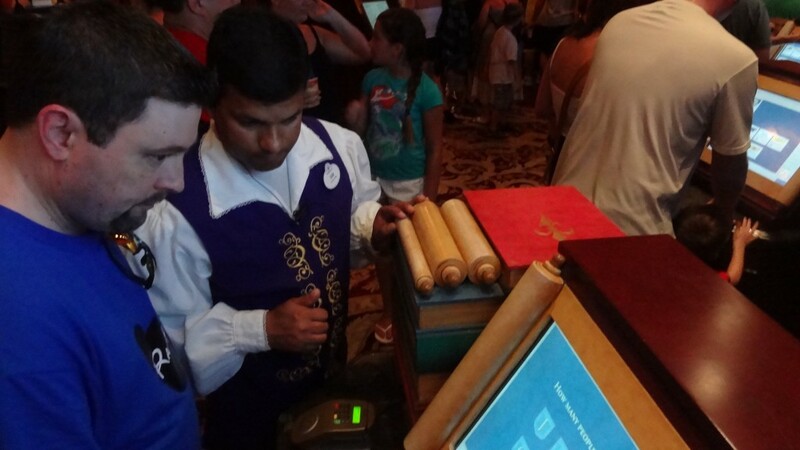 If you have any problems with the touch screen, cast members are all around to help you during the ordering process. You will be guided on the screen to order an entree, drink and even a dessert. All options have descriptions and some visual images to help you decide. There are so many delicious items on the menu, it truly is hard to pick just one. The touch screen connects to your MagicBand, allowing you to use either your Dining Plan or credit card linked to the band. Once you complete your order, you will receive a receipt and head out of Beast’s library and step into the rest of the amazing castle! You will first be ushered into the grand ballroom. You will instantly be transported into the movie, Beauty and the Beast, when Belle and the Beast are dancing to Mrs. Pott’s singing. 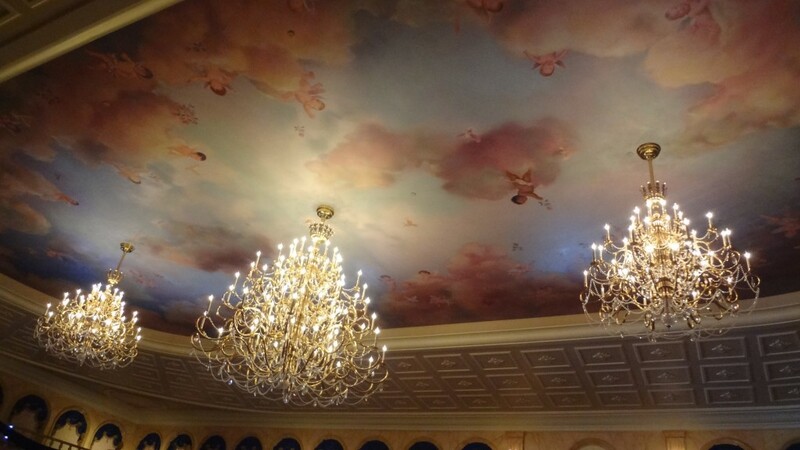 The Disney Imagineer’s did such an outstanding job recreating this gorgeous ballroom. It truly is breathtaking. On your right of the ballroom, is a row of soda fountains and cups to pick up your drink order. It is a do it yourself serving station. There are rooms on either side of the grand ballroom. To your left is the West Wing. The lights are dim, there is a storm outside with thunder and lightening. In the far corner will you find the Beast’s red rose where you can see the petals slowly falling off. You will also discover the slashed portrait of the Beast in human form. To your right of the grand ballroom is what I like to call the Music Box room. In the center of the room is Beast & Bell turning, like on a music box. On the walls around the room are painting, recreating scenes of the movie. Before you enter these rooms – along the aisle are silverware stations. Make sure to stop and pick up your silverware and napkins. You may select a table in any of these rooms. Now the magic really begins. A cast member will roll a cart over with your order. It is simply amazing how they are able to find you in this large restaurant! Sit back and enjoy your delicious meal! 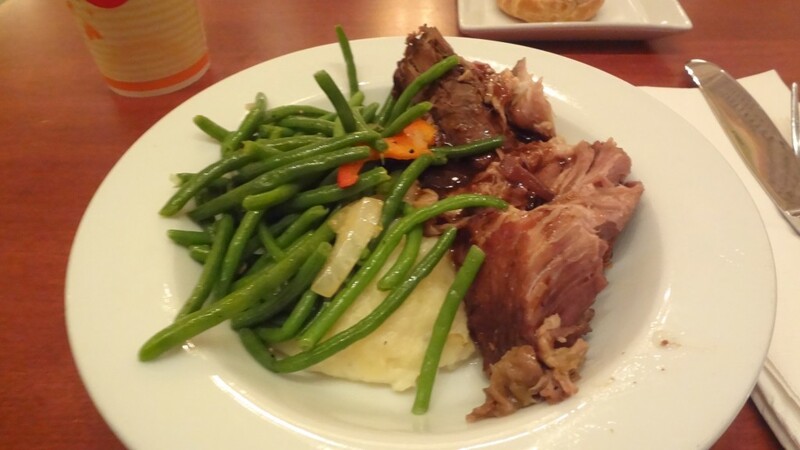 Let me describe some of these amazing entrees and desserts served here at Be Our Guest. During our first visit for lunch, my husband and I decided to each get something different and share. This turned out to be an excellent idea! My husband ordered the Croque Monsieur is a grilled sandwich of carved ham, Gruyere cheese, and bechamel with Pommes Frites. 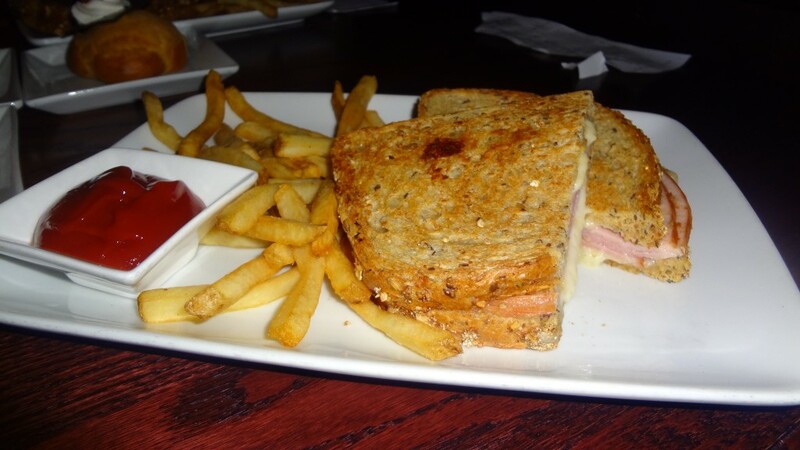 If you love grilled cheese sandwiches – you will love the Croque Monsieur. The bread was perfectly toasted with the right amount of cheese and ham. The carved ham with Gruyere cheese was excellent paired together. The presentation of the entrees on classic white dinner plates instead of the usual Disney paper plates was exquisite. Disney definitely brings sophistication to a theme park lunch. I absolutely love roast beef sandwiches, so once I saw the Carved Prime Chuck Roast Beef Sandwich, there was no need to look further. 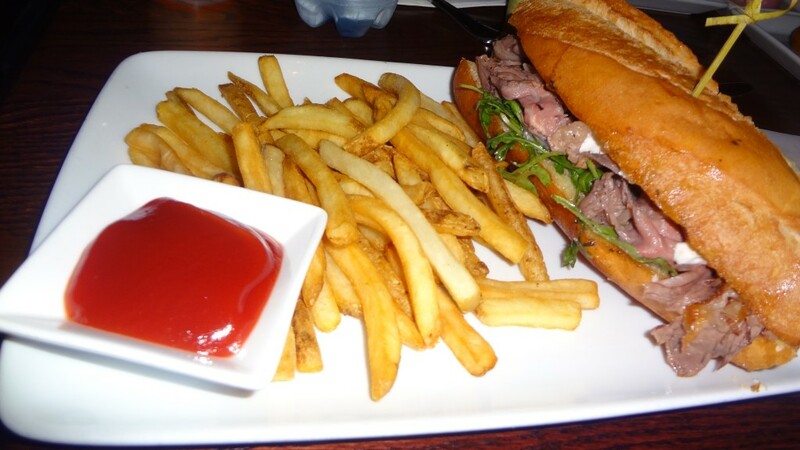 The sandwich was served on a warm baguette with horseradish sour cream and Pomme Frites. I almost ordered the sandwich without the horseradish sour cream because I am not a fan. However, I am so thankful I kept it on. It really added to the flavor of the roast beef. I have eaten several roast beef sandwiches during my life and the deal breaker for me is always the bread. A lot of places have a tendency to use a bread that is too hard. The key to an excellent roast beef sandwich is a nice soft bread. The baquette was perfect! My husband and I enjoyed both sandwiches and would definitely order either one again. However, the clear winner for us was the Carved Prime Chuck Roast Beef Sandwich. Several months later, we returned to Walt Disney World and decided our final meal of our trip would be lunch at Be Our Guest. I just had to have roast beef sandwich again. Just like our previous visit, the sandwich was amazingly delicious. My husband decided to try something different. He had been hearing rave reviews of the Braised Pork which is a slow-cooked pork with vegetables and bacon served with mashed potatoes and green beens jardiniere. The pork was perfectly cooked. It was so tender and juicy, you did not need a knife. The vegetables and mashed potatoes were also excellent. However, my husband’s only complaint was he wishes there was gravy for the pork. Let’s talk dessert! I would definitely say I have a sweet tooth and Disney allows me to satisfy my craving for sweets. 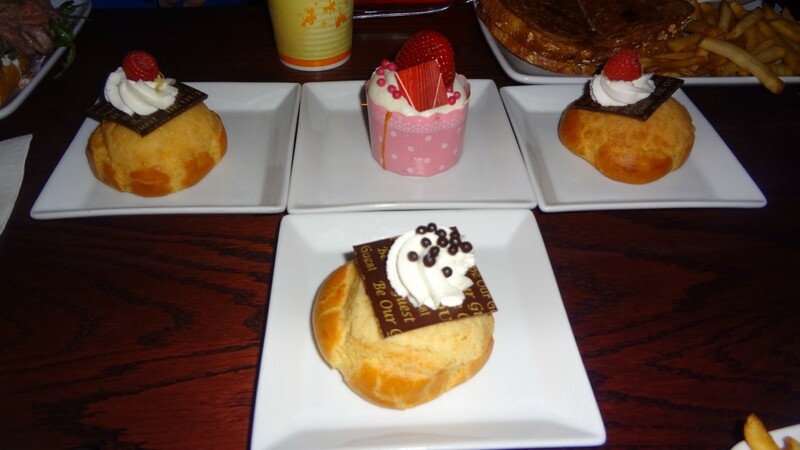 The biggest problem at Be Our Guest is there are so many delicious dessert options. I always struggle with what to order. The options are a selection of cupcakes and cream puffs – Strawberry Creme Cheese, Triple Chocolate, & Lemon Meringue Cupcakes plus Chocolate Cream, Tropical Fruit Cream and Lemon-Raspberry Cream Puffs. They also now offer The Master’s Cupcake which is a chocolate sponge cake topped with Lumiere’s special grey stuff. I always lean towards a cupcake while my husband goes for the cream puffs. We have now tried four of these amazing desserts and none of them were a disappointment! Delicious dessert options available – profiteroles and cupcakes! Be Our Guest is now my favorite place to dine for lunch. The food and service is worth the wait! Be Our Guest accepts the Disney Dining Plan which allows you an entree, dessert and drink.